French Polynesia with its capital Papeete is located in Oceania (Oceania, five archipelagoes (Archipel des Tuamotu). It covers some 4,168 square kilometers (slightly less than one-third the size of Connecticut) with a population of 287,881. 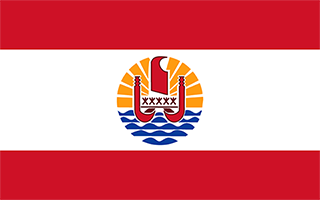 French and Tahitian are the languages spoken by people in French Polynesia. Thiscountry has no land-based border with any other country. French Polynesia is a set of islands that is an overseas country attached to France. Located in the South Pacific Ocean, it is halfway between California and Australia. Summer is from November through April, with a warmer and more humid climate and winter is from May through October, when the climate is slightly cooler and drier. When you step out of the airplane, you'll immediately notice that the air is warm and humid. Be aware that everything is very expensive in French Polynesia. Even budget accommodation is tough on the budget, as is food, even groceries. So if you visit, take lots of money, you will need it. The topography is mixture of rugged high islands and low islands with reefs. The average density of population is about 69 per km². The climate in French Polynesia can be described as tropical, but moderate. Potential natural disasters are occasional cyclonic storms in January. To reach someone French Polynesia dial +689 prior to a number. The local cellular networks are operated on 900 MHz, 3G, 4G. Websites typically end with the top level domain ".pf". If you want to bring electric appliances (e.g. battery chaarger), keep in min the local . The sign for the locally used currency Franc is XPF. Two red horizontal bands encase a wide white band in a 1:2:1 ratio; centered on the white band is a disk with a blue and white wave pattern depicting the sea on the lower half and a gold and white ray pattern depicting the sun on the upper half; a Polynesian canoe rides on the wave pattern; the canoe has a crew of five represented by five stars that symbolize the five island groups; red and white are traditional Polynesian colors.